It’s always great to have shearing over. It’s generally an enjoyable day once we finally get it together. With our erratic Georgia weather, where it can be 70 one day and 30 the next, we have often had to reschedule. I like to shear the end of February, before most of the lambs are due. Last year’s unusual snowfalls forced us to cancel because we couldn’t get up our driveway! This year I decided on March 1 after careful attention to weather forecasts. February 29 brought tornado watches to the area. March 1 was sunny, warm, and windy – a pretty good day! March 2 brought more tornado watches. For once the forecasts were accurate. 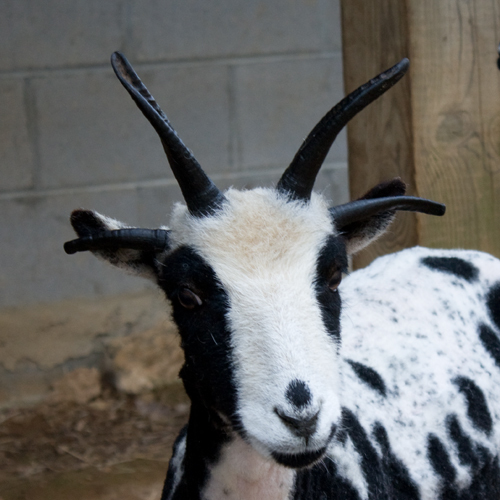 The sheep look so clean! One of the things I enjoy is how the sheep seem to be all horns when the wool is gone. 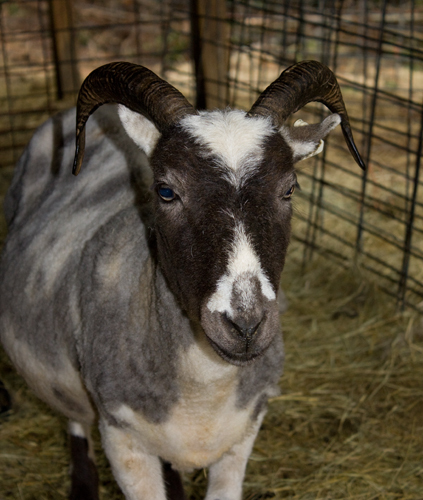 Hillside Holly sports an interesting “black widow spider” face, a long soft fleece, and lots of room between horns and face. 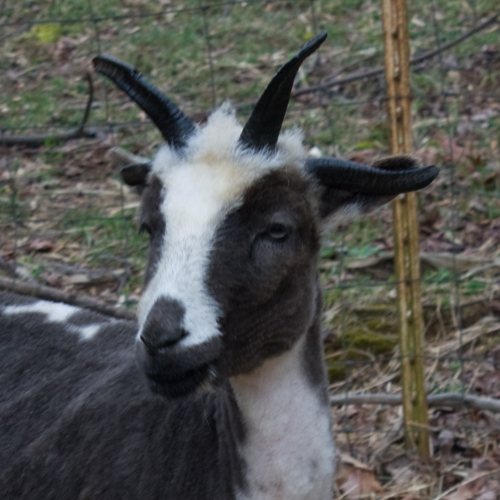 Patchwork Quinn, with her coquettish eye liner around a blue eye, keeps her horns way out there. 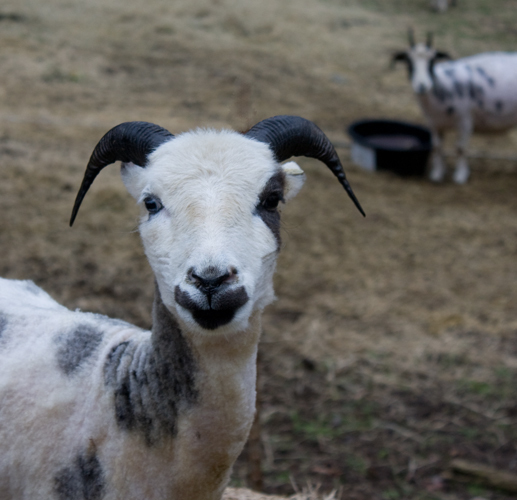 Sweetgrass Gavotte (a 2010 lamb), another blue eyed beauty, frames her feminine face with balanced horns and an upright alert look. 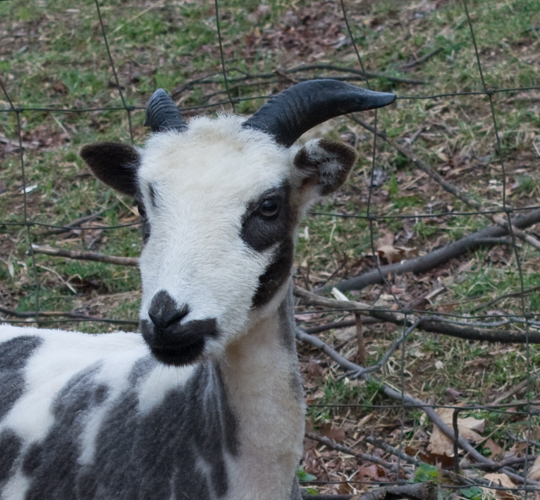 Patchwork Fortune, a 2010 lamb and my little deer, has horns that started out straight back before making a sharp turn outward. 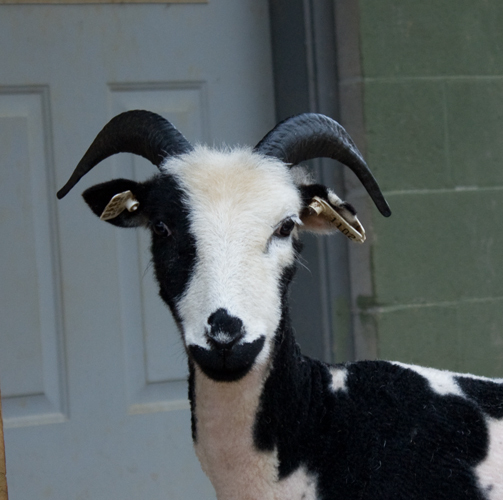 My preference is still for four horns……..
Patchwork Bling (2010 lamb) have plenty of room for the shears. 1 Response to Shearing is over.. Pretty girls – I especially like Bling.